Niagara wine is some of the finest on earth, and each year finds more and more people flocking to the region to experience it firsthand. From award-winning chardonnays and pinot noirs to the icewines that put the region on the world’s winemaking map, any trip to the Niagara Peninsula would be incomplete without some time spent in and around a vineyard. Of course, drinking excellent wine is only enhanced when you eat an excellent meal along with it, which is why some of the area’s wineries have on-site restaurants. And, because agriculture has long been practiced and practiced well in Niagara, these excellent restaurants make a point of showcasing local vegetables, fruits, cheeses, meats, and fish on their menus. An ideal marriage of taste and presentation, the next time you come to relax and unwind in Niagara, be sure to snag a reservation to dine at one of these four wineries’ restaurants. This vineyard is family owned and operated and strives to be organic. The 34-acre Ravine Vineyards practices sustainable farming in the sub-appellation known as St. David’s Bench. Producers of a number of excellent wines, they make especially remarkable Chardonnay, and their restaurant is more than up to the task of providing meals that live up to their wines’ reputations. A true farm-to-table restaurant, Ravine does almost everything themselves: They bake their own bread, grow their own organic vegetables, and raise their own pigs. Beyond that, they also plan a menu with the help of their winemaker for meals that always have wine at their center. Trius is a winery that makes every type of wine from cabernet sauvignon and pinot noir to sparkling bruts and icewines. A winery that features some of their finest offerings in person at the winery only, their restaurant’s selection is vast enough to satisfy almost any oenophile. They use as many local ingredients as possible, and of course, their servers are excellent at assisting diners with pairings. A family-run winery that has been in operation for over 50 years, Peller Estates has achieved plenty of international recognition, especially for their rieslings, chardonnays, and icewines. In fact, London’s International Wine & Spirit Competition recently named them the Best Canadian Winery of the Year. Their award-winning restaurant centers its menus around their wines and the changing seasons. Each dish has been paired with a wine under the guidance of Peller’s winemaker, but the staff is knowledgeable, too, should you want a different option. Award-winning wines are commonplace at Strewn, an unusual winery that includes a winery cooking school in addition to its vineyards and restaurant. 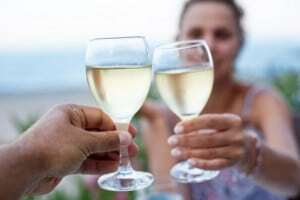 Their wines focus on the most traditional grapes: cabernet franc, cabernet sauvignon, merlot, riesling, sauvignon blanc, gewurztraminer, pinot blanc, and chardonnay. Their restaurant, Terroir La Cachette, recently closed, and they are about to open another one on-site called OLiV in mid-April. A casual fine dining restaurant and tapas bar, OLiV will feature fare that allows the winery’s exceptional wines to shine through. 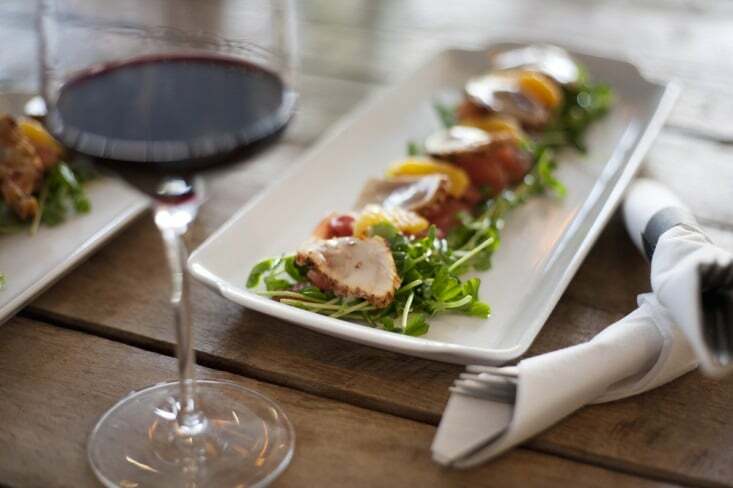 Whether you love red wine or white, seafood or lentils, eating and drinking in the Niagara region is an exquisite pleasure when done at these four wineries’ restaurants.